This terrific mystery/thriller departs from Nesbø’s Harry Hole detective series and is — hard to believe — even better. Taut, suspenseful, but without the repetitive gunfights and car chase scenes so many thrillers rely on. Rewarding to the very last line. I have nothing against gun fights or car chases in mystery/thrillers, but they are rather predictable, and certainly relied on heavily. This book is true to the genre but also refreshingly different. The title character is a young man who has lived in jail for 12 of his 30 years — a strung out junkie with a mystical quality that leads others to tell him secrets and ask forgiveness. When he embarks on a mission of revenge, you don’t know quite what to expect from him. And, he keeps you off balance all the way through. 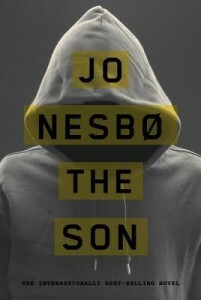 Nesbø has already made quite a name for himself with his Harry Hole series (despite the unfortunate name). I find these dark police thrillers set in Nesbø’s Norway to be far superior to Stieg Larsson’s “Girl With…” books, though with a similar DNA. So far I’ve read three Harry Hole novels and enjoyed them all very much. This one was even better. It’s not just about the crimes, it’s about love, forgiveness, and facing dead ends. When Sonny Lofthus’ policeman father committed suicide over his corruption, it sent The Son into a tailspin of self-destruction and incarceration. He’s living only for his next fix when a fellow inmate tells him it wasn’t suicide but murder that took his father away. His father wasn’t corrupt but killed for fighting corruption. That sets Sonny on a path of revenge; not just for his father but to right other wrongs he has taken the rap for as well. Chief Inspector Simon Kefas is on his trail. A woman is about to fall in love. Nesbø keeps you guessing right to the very end. Excellent. For more about Nesbø and his books, click here. I was hesitant to pick up this book. The title and cover art just looked a bit icky-romance for me. However this book is a perfect representation of that old adage about covers and judgement. With two interwoven story lines — more than a century apart — revolving around the legend of the Selkies, this is a much more interesting novel, and not a romance at all. Gifford’s first novel is set in the Scottish Outer Hebrides, both in the recent past and more than 100 years earlier. She does an excellent job of conveying the dramatic atmosphere of this cold, desolate, yet also dramatically beautiful environment. She does an equally fine job of portraying her three main characters: Ruth, the emotionally damaged wife trying to build a life and a B&B in 1992; Alexander Ferguson, the young reverend from the 1860s who has a passion for mermaids and selkies; and Moira, his maid, who is equally passionate about destroying the man who brought misery and death to her family. History, legends, and natural history are seamlessly woven into their stories, further enriching this multi-faceted reading experience. However, it is the empathy you will feel for these characters that ultimately wins you over. Ruth and her husband are renovating an old parsonage into a bed and breakfast when the body of an infant is found beneath the floorboards, its lower legs fused together like a mermaid or seal. Ruth is determined to solve the mystery of this small baby as well as learn the hidden truth about her own connections to this isolated community. Finding the writings of the Reverend Alexander Ferguson is just a start. For more about Gifford and her novel, click here. You’ll notice this book also comes with a slightly different title and cover. Not sure it’s right either — looks like a horror story.